Body Transformation: Setting The Tone With A New Body! Marc had to set an example for his daughter who followed in the shadows of his actions. 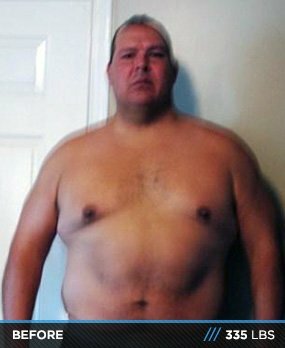 See how he shunned the couch, lost 110 pounds, and changed his family’s future! In January 2009, I was sitting in my TV chair with pain in my feet. I was stuffing my face with junk food and realized my seven-year-old daughter was in her playroom, 20 feet from me, doing the exact same thing. Then it hit me. She was doing this because it's what she sees day-in and day-out from her father. I struggled my entire life with weight problems. I cycled up and down in different stages and was never taught about proper nutrition. I learned how to exercise in high school, played football, and joined the weightlifting team, but nobody explained the importance of proper nutrition back then. I ate anything and everything without regard. I joined the U.S. Army after high school and was in decent shape from the level of activity required, but again, the lack of nutritional knowledge made me gain weight. Every time I gained the weight back, I put on more than before. At one point, I tried a "portion control" diet and workout plan which worked to an extent, but it didn't teach me about calorie intake and macronutrients. It said to cut your calorie intake, exercise, and you will lose weight. I lost weight, but I didn't look like I wanted to, and I eventually hit a plateau, lost interest, and quit. During the next 10 years, I continually gained weight and went from 250 (after the military) to 335 pounds. Along with the aging process came medical problems. I have a family history of diabetes from both sides, and had borderline high blood pressure and cholesterol. If you have ever been overweight, you understand the mental funk I was in. I was on a downhill spiral and moving fast. I needed to change drastically. That day in January I mentioned earlier is when I made the decision to do something about my weight. The only tactic that could work was to get up and start exercising. I told my wife I was joining a gym and we started searching. We found one with everything I needed that also had plenty of things for my wife and daughter. On January 20, 2009, I started my journey. Keep in mind that I knew nothing about nutrition other than portion control, so that's where I started. I ate a portion of protein, carbs, and vegetables for breakfast, lunch, and dinner and drank a meal replacement shake between meals. It added up to five meals per day (one every 3-4 hours). I went to the gym every other day, lifted for a half hour, and rode the stationary bike for 30 minutes. I knew it was going to be a long journey, so I started slow. Nothing could interfere with my gym time. I made the commitment and stuck to it. After six months, I lost 50 pounds. Exercise became part of my life. I felt and looked better and my self-confidence was back. The compliments from others boosted my ego. However, what I knew was going to happen happened and I hit a wall; the dreaded plateau. I spent three months in a rut because I was too proud to ask for help. I thought I could get past it if I gave it time, but that didn't happen. Finally, I asked a friend for help. I was looking for pointers or tricks to get me past the plateau, but what I got was an education. One night, I sat in front of my TV, had my nightly drink, and decided to email my friend, Antonio Marin-Vargas. He's a competitive bodybuilder and personal trainer. At the time, we weren't close and had only met through our wives, but he gave me his card and told me to call if I had any questions, so I did. Antonio agreed to help me and within 24 hours he created a diet and workout routine for me that was drastically different from what I had. I started it the next day and by the end of the first week I lost weight again. 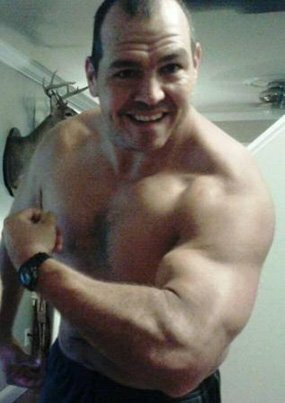 I worked with Antonio, educated myself on proper nutrition, and lost 60 pounds and gained muscle. I reached my goal and weighed 225 pounds with seven percent body fat. 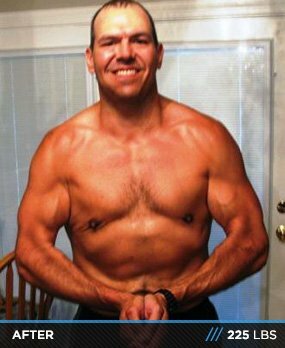 During this time of revelation, I discovered Bodybuilding.com and the resources it has for people looking to change their lives. I wanted to take my shirt off and not worry about what people were saying about me. I wanted to look like I never had before. Antonio is an excellent trainer, however, he didn't workout with me. He created my programs, answered my questions, and encouraged me, but I did the work on my own. This is where Bodybuilding.com came in. I read articles, watched videos, went through the forums, and looked at BodySpace pages for motivation. 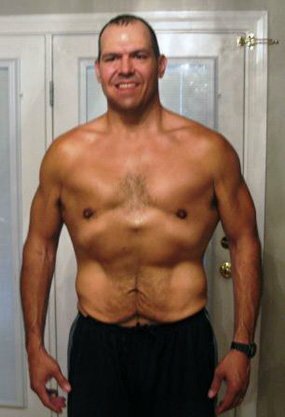 One of my all-time favorites is the forum thread "Transformations From FAT to FIT." Those people inspire me to keep going, keep eating right, and to keep my eyes on the prize. They inspired me to start my own BodySpace page. Bodybuilding.com is a one-stop shop for all the tools you need to transform. All you have to do is fix your head and your body will follow. Note: Pick two abdominal exercises after each session and go to failure. The most challenging part of my transformation was the entire lifestyle change. It can be a rollercoaster ride with everyone around you. At first, people wish you luck. Next, they say you inspire them and ask how you did it. Upon explaining, they say it's too hard and they can't stop eating. Then they mock you for your strict adherence and ask why you can't eat like a normal person. Finally, when you reach your goal, people say they wished they had your willpower. Some ask what kind of surgery you had, and others will be haters. You have to find the positive people and stick with them; like-minded people know what it takes and understand the sacrifices involved. You can find these people in two places: the gym and Bodybuilding.com. If you follow your plan, document your results, and stay consistent, your entire lifestyle will change and you will love it. After reaching my first goal, I reached several more. I put on good mass and am cutting fat to show it off. I'm currently at 260 pounds with 12-14 percent body fat. I'm in the best physical condition of my life and it feels great. I have no aspirations to compete publicly; every day I step in the gym is a new competition. Every new nutrition plan is a competition and I look forward to them because the results are worth it. As long as I avoid injury, I will work out as long as I can. I love it too much to quit and feeling healthy is enough for me to keep going. I don't plan to become a trainer, but I will say that I gained a following. People come to me for advice and knowledge, which is cool. I went on my first jog with my daughter the other day and smoked her. Fix your head and your body will follow. Do not go at it alone. Find people with knowledge to help. Educate yourself. Get on Bobybuilding.com. I can't give enough praise to Bodybuilding.com. They have the largest selection of supplements out there at the best prices available. Bodybuilding.com always has everything I want and it's at my door in 24-36 hours. I compared all the big-name sites and I always come back to Bodybuilding.com. The inspiration and motivation I get from the site is comparable to none. If I want to research an exercise, workout, diet, nutrient, or supplement, there is an article on the site about it. If I hear about an exercise I want to try, they have it listed on the site and show me a video to do it properly. If I need motivation, there are BodySpace pages and forums to give me inspiration or a good laugh when I'm bored.